Are Baby Teeth Important For Baby? 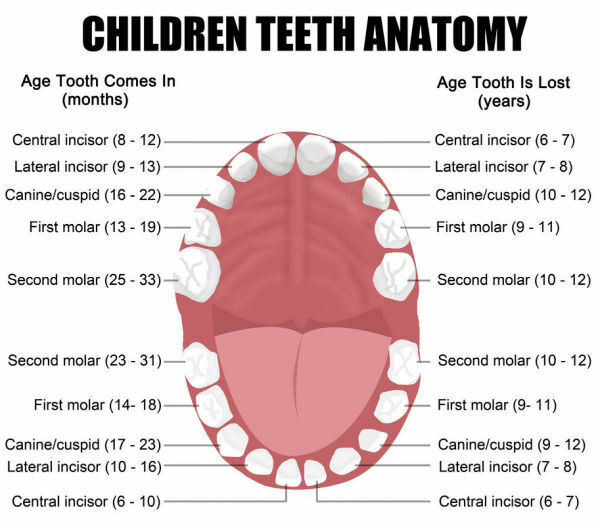 How Are Baby Teeth Different From Adult Teeth? At What Age Do Baby Teeth Start Falling Out? When Do Babies Begin To Chew? What Foods Are Good For Baby Teeth? Is A Bedtime Bottle Good For Baby? How To Take Care Of Baby Teeth? When Should Baby See A Dentist? Do You Floss Baby Teeth? Many people mistakenly assume that baby teeth have no roots because when they fall out, the roots are not visible. This is because primary teeth roots are so small such that they get easily absorbed by the baby’s body. By the time a tooth is falling out, the roots will have been reabsorbed completely. During pregnancy, it’s possible to give your baby’s teeth a good and healthy start by strictly adhering to the advice from your doctor on eating habits. This will typically include eating a well-balanced diet that contains foods that are calcium-rich such as dark leafy greens and yogurt. The first baby teeth to emerge are the bottom front teeth. These are followed by the upper front teeth before a lower molar emerges. New teeth will usually erupt after that in pairs every couple of months. The baby should be taken to a pediatric dentist as soon as the first tooth emerges, usually before age one. Even though baby teeth are temporary, they still have an important role to play in childhood development and they should be well-taken of. They help the baby learn to talk and chew as both these functions would be very difficult without baby teeth. Having baby teeth in place makes sure that when adult teeth emerge, they grow properly. They also act as a guide on how the eruption of a child’s permanent teeth will be, setting a clear path for them to follow. Your baby’s teeth also help in maintaining the arch of the jaw during its growth. Your baby should, by age 3, have grown a full set of health primary teeth. A child’s permanent teeth usually begin replacing baby teeth from ages 4 to 6. Baby teeth differ from adult teeth in a number of ways. To begin with, they are usually smaller in size compared to adult teeth and they are also fewer. Baby teeth are 20 while an adult can have 28 to 32 permanent teeth. Primary teeth are normally whiter compared to adult teeth and they tend to have smaller roots. On average, your child’s first baby or primary tooth should fall out at around age 6. The last of the baby tooth to fall out should be around when he or she is about 12-13 years old. A baby tooth falls out on its own as soon as a permanent tooth begins to replace it. If the permanent or secondary tooth grows in front or behind a baby tooth, have it checked out by a dentist to prevent any future need for orthodontics. Most babies will experience their first encounters with textures when they put fingers, objects or toys in their mouths. Such mouthing activities are common around 6-9 months. These expose babies to new sensations and movements which will be vital when they encounter different types of foods. Typically, babies are ready for solid (lumpy) foods when they are about 8 months old. When choosing foods that encourage your baby to learn chewing begin with the easiest ones for him first–those that don’t require much-chewing pressure to break up the food. Ensure the child gets a balanced diet in line with the recommendations from the food pyramid or from your pediatric dentist. Try and limit the servings of starches and sugars as this helps protect baby teeth from decay. Avoid nursing your baby to sleep or putting him/her to bed with a bedtime bottle of formula, milk, juice or even sweetened liquids. Instead only use water in the bottle. A bedtime bottle containing anything else besides water may cause what is known as baby bottle tooth decay (BBTD). This is a leading cause of dental problems for babies under 3. A toothbrush removes plaque that can lead to dental problems later. A soft-bristled toothbrush, preferably the type designed specifically for use by infants should be used to brush at least once per day, preferably at bedtime without toothpaste. After age 2, you may introduce a soft-bristled toothbrush and the child may begin using a small amount of toothpaste. Remember young kids may need some help to brush their teeth effectively and also to spit and not swallow toothpaste after the brushing. To prevent the risk of developing dental problems, you should ensure the baby visits a pediatric dentist as soon as you notice the eruption of the first tooth or at least not later than baby’s first birthday. Flossing forms an important component of good oral hygiene for your baby and it’s safe to start early. Largely, the introduction of flossing will be dependent on the number of teeth your child has as well as how close together they are. It’s obviously not necessary to floss when your child only has a few teeth that are most likely far apart as the toothbrush will easily reach all the surfaces. If unsure whether to initiate flossing consult your pediatric dentist. Peter is a dental hygienist in the city of Chicago, IL. In his free time he likes to write blogs and product reviews on anything dental health related. Is Beer Bad For Your Teeth? We try to make dentistry fun. Not while you are on the dental chair, holding onto dear life, but when you are on your chair at home, or at work. Most people try to avoid dentists and hygienists as much as possible. Even though dental health is important, it does not have to be painful and costly. Hopefully this blog can help you learn about dental hygiene, help you find reasonably priced methods and products to maintain your dental health, and help you learn a thing or two.